By LUDWIG VON KOOPA - How do the other systems handle Ace Attorney? With CONTRADICTIONS! Once billed as “unmissable” for long-time series fans, Phoenix Wright: Ace Attorney Trilogy is once again about to be ported to new consoles. This time, it's finally releasing outside the realm of Nintendo and mobile, and onto Xbox One, PlayStation 4, and Steam. The release date? April 9 for outside-of-Japan. ...It's actually already out in Japan, but we're not too interested in that. One may wonder what the hold-up is, especially since the Japanese version already has full English in it. I'd say it gives CAPCOM, the franchise owner, some time to get more than zero pieces of Ace Attorney merchandise up on the new CAPCOM Store. There actually is something “new” to this version of Ace Attorney Trilogy that wasn't in previous re-releases. Additional language support! French, German, Korean, and Simplified + Traditional Chinese language support will be added in a post-launch patch, most likely in the summer. If CAPCOM was always up for doing post-launch patches, why haven't they done them to fix some of the series’ infamous typos? Still, the right observation is, “the differentiator isn't even coming out at launch.” And a lot of Spanish people are upset that their language is ignored despite the original Ace Attorney games being released in Spanish. Oh well. I'm still waiting for Ace Attorney Investigations 2 to come out in English. But enough of that. By LUDWIG VON KOOPA - I thought we'd get useless information. It turns out that Pokémon Day is worth more than just making the latest Pokémon movie available for free through official means. 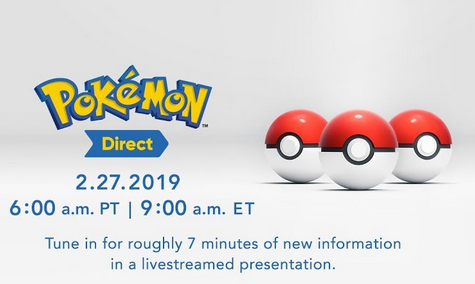 No, going back to at least 2016, it's also used for announcing a brand new Pokémon generation through an utterly short and inconsequential trailer. Roughly 7 minutes of new information? With three Poké Balls? Perhaps representing three starter Pokémon? Pokémon Generation 8—the next mainline Pokémon RPG for the Nintendo Switch—is supposed to release at the end of 2019. It would make a lot of sense for it to now be revealed through a trailer. Everything (besides the trailer embed) before this sentence was written the night before the February 27 Pokémon Direct. Since then, it became clear that I'm right, and not only was Generation 8 revealed, but so was the new region and the three new starter Pokémon! It turns out that the three Poké Balls really were meaningful. Tomorrow is Pokémon Day 2019, as decreed by The Pokémon Company International. Just like last year with Pokémon the Movie: I Choose You, they have made Pokémon the Movie: The Power of Us available for a limited time on pokemon.com. The Power Of Us is the most recent Pokémon movie, released in United States theatres only three months ago. Three months before that, I expressed concern that The Power of Us would be a bad movie experience compared to what I think is the best Pokémon movie, Pokémon the Movie 2000: The Power of One. It's finally time to see if my concern was warranted, as myself, RawkHawk2010, Kamek, and Kamek's “female friend” all join together to live-react to the viewing of the movie! Featuring riveting sub-plots such as, will Kamek ever sync up with Rawk and myself's timestamp? Spoilers: it's a better plot than the movie itself. By EGYPTIAN KOOPA - I'm not surprised that this exists and neither should you. Too many people review trailers by watching them again and again. However, many people only see a trailer a few times, and the most lasting impression one leaves on a viewer is from the first time it is seen. As such, I will not review this trailer in the 'normal' way. I'm going to pause after every scene transition and write my feelings on the matter. I have seen Frozen before. It was certainly not as appealing to me as it was to the majority of squealing girls who dressed up as their favorite wintery princess and/or queen that Halloween. Six years later, the trailer for its sequel has arrived, and I have arrived to watch it! 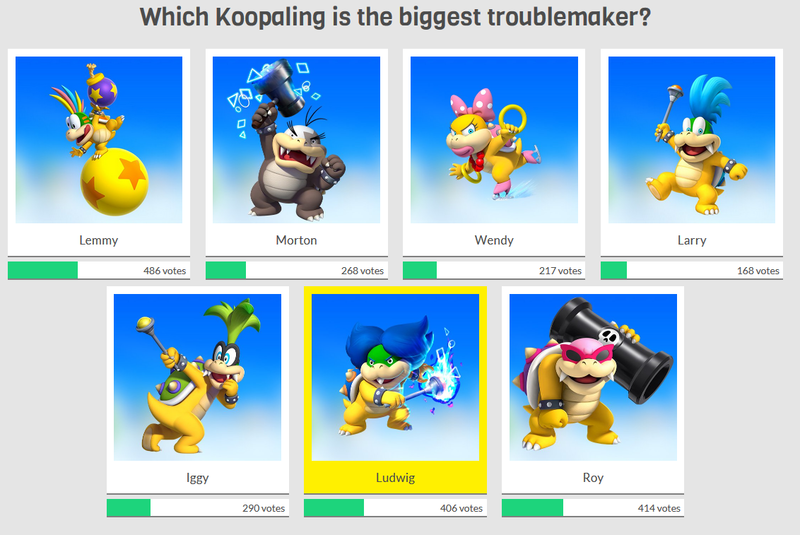 Vote Ludwig Von Koopa For Biggest Troublemaking Koopaling! By LUDWIG VON KOOPA - They call it a “fun poll”, I call it a matter of personal pride. I'm not in first place? What is this? This is an absolutely shameful result so far. There's no definitive end time to the poll, so I think it's up to KoopaTV readers to right the wrongs of the results. To be explicit, the problem is that I'm only in third place, behind Lemmy Koopa and Roy Koopa. In reality, I am by far the most troublesome of all of the Koopalings! I'll prove it with LOGIC. By LUDWIG VON KOOPA - By the way, KoopaTV is the site that cared the most about Doug Bowser prior to today. Today in the news, current Nintendo of America President and Chief Operating Officer Reggie Fils-Aime (alternatively Reggie Fils-Aimé) announced that he will be retiring from Nintendo effective April 15. Since KoopaTV has more important things to publish on April 15, I'll be writing my thoughts on this now. I'm not going to go over a retrospective of the career of Reggie Fils-Aime or write about memes spawned because of him, because that's sappy, cliché, and I don't think you care. I know I don't. A long-time KoopaTV reader recently asked me who Reggie Fils-Aime even is. I'll just say this: Prior to becoming President and Chief Operating Officer of Nintendo of America in 2006, Reggie was also the Executive Vice President of Sales & Marketing. By LUDWIG VON KOOPA - Happy birthday to RawkHawk2010 the staffer! Today, February 20, happens to be KoopaTV staffer RawkHawk2010's birthday. He's now 9 years old! Wow! As a present to his continued longevity, and to start what might be a trend for this site, I'm going to write a concept of what his Spirit Battle would be like if Rawk Hawk managed to get any representation in Super Smash Bros. Ultimate. The last time he's gotten anything was as a sticker in Super Smash Bros. Brawl. With a Spirit Battle, he'll get a lot more! First some details on what kind of spirit he'd be, and then details on his actual fight and the references included. By LUDWIG VON KOOPA - You can decide by the end if this is just confirmation bias or I make genuine points. Ever since its announcement, I've had a very negative slant towards Pokémon: Let's Go, Pikachu! and Pokémon: Let's Go, Eevee!. Then I went ahead and basically used series director Junichi Masuda's comments about Pokémon: Let's Go as an indication that he's jumped the Sharpedo. Then we ignored its release day and haven't mentioned it since, except the obligatory mention that it's a 10-million seller. I'm pretty sure that, for my part (can't speak for the other staffers but this likely holds true for them as well), I wasn't going to mention Pokémon: Let's Go ever again except for the release of the next Pokémon mainline RPG for the Nintendo Switch. In what capacity that would be in would depend on if I like that next game or not. And then they released a free demo of Pokémon: Let's Go, Eevee! (as well as Pokémon: Let's Go, Pikachu!, but I assume that's the same content) on the eShop last week. I played it. I didn't like it. Here's why. By LUDWIG VON KOOPA - The Yoshi's Crafted World demo makes a perfect KoopaTV discussion piece. With the proposed Green New Deal putting high-speed trains and farting cows back on the public mind, Nintendo released a demo of Yoshi's Crafted World on the Nintendo eShop, following last week's Nintendo Direct. On KoopaTV, we have trains and cows on the mind all the time, so this is topically appropriate. Plus, I have very strong opinions on the Yoshi franchise. We already knew from Nintendo's E3 2017 (back when Yoshi's Crafted World was called “Yoshi 2018”... whoops, that slipped) that cows and Moo Moo Meadows Milk play a big role in the world. Let's examine just what that role is, how trains go into it, and our critical commentary on all of that. By LUDWIG VON KOOPA - I don't like Tetris. Once upon a time, a year ago, I was asked in a request to write about Tetris. I never did, since I dislike Tetris, and I was planning on interviewing someone associated Tetris to fulfill that request. She agreed, and then bailed on me. After repeated requests. So I never planned to write about Tetris ever again. 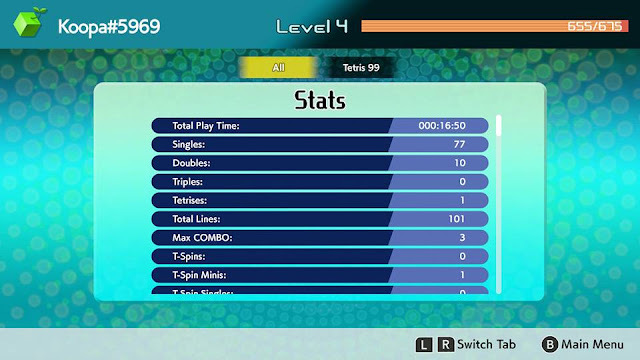 Suddenly, the Nintendo Direct from two days ago introduced this releasing-after-the-Direct game, Tetris 99, or as we called it first (before anyone else), “Tetris Battle Royale.” Free for anyone with a Nintendo Switch Online subscription, which is everyone on the KoopaTV staff thanks to our family group. It's a VS. Tetris game (the kind where if you get combos you get to dump trash on other people's boards), but there are 99 players. Not 100. But 99. You probably don't have to worry about 98 other people ganging up on you, though. Like other battle royales, there's a large enough space of possibility that people are concerned with one another but probably not you. Just know you'll get some trash blocks and more trash blocks the more you play. I wouldn't say there's that much direct interaction between players, then. Or maybe there is and I just don't know what I'm doing. I've played Tetris 99 for over 15 minutes, so I'm obviously quite qualified to write a whole article about it. By LUDWIG VON KOOPA - The game's plot is about a secret, much like everything else about it. The previous Nintendo Direct, the Nintendo Direct in September 2018, introduced a new GAME FREAK title for the Nintendo Switch named Town. Yesterday's Nintendo Direct didn't mention Town at all, to the chagrin of literally no one. There's a certain segment of the population that was expecting news about a different sort of town, one in the Animal Crossing vein, and they're quite upset. But GAME FREAK's Town? Nah. KoopaTV's February 13, 2019 Nintendo Direct Live Reactions! By LUDWIG VON KOOPA - Enthusiasm lacking. 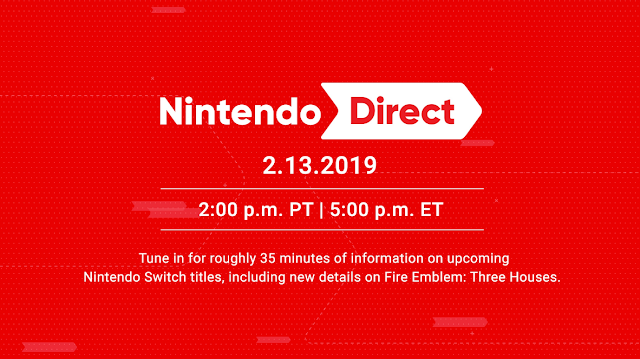 I already did much of my introduction to this log within the reaction log below for the Nintendo Direct of February 13, 2019. First Nintendo Direct of the year. In attendance are myself, Rawk, Wendy, and non-KoopaTV-staffer-but-friend Ryu, or MarioSun90. For a while, the Direct was appealing to his specific tastes... and then it changed. Please feel free to watch the Nintendo Direct as we live-react to it. Here's the embed, but the optimal thing is to open it in another window and compare our reactions (per the time stamps) with the video's time-stamp. Fire Emblem: Three Houses was the headliner of this Direct, but let's just say that this website doesn't care. But don't take the above-the-fold's word for it. Read the whole reaction log and confirm for yourself! It just opened. Grand opening! Mega Man (Mega Man), Roll (Mega Man), Nero (Devil May Cry 5), Palico (Monster Hunter World). There's just one problem with that artwork, compared to what's in the store. By LUDWIG VON KOOPA - Even if I can't eat them, I need to join a Splatfest team. 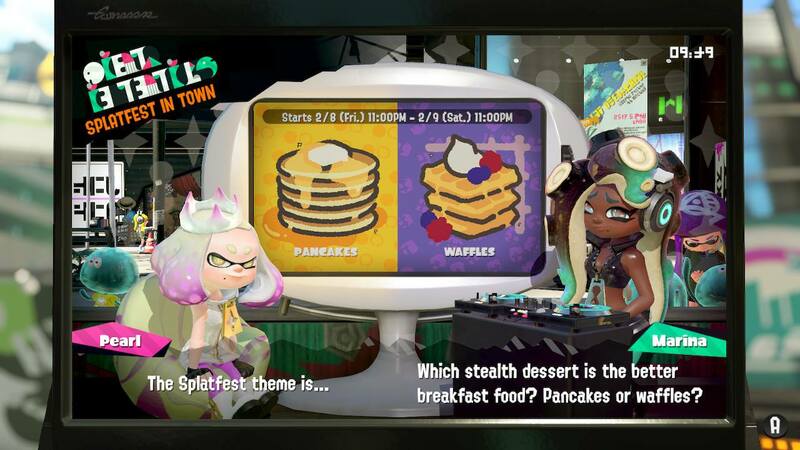 This has certainly been one of the more interesting weeks in KoopaTV history, and it ends tonight: From publishing to Saturday night is another Splatoon 2 Splatfest: Pancakes vs. Waffles. If you didn't know that, you have not been paying attention to the site, because the first four days of the week have revealed a very divided KoopaTV. I still need to pick a team since the Splatfest does start tonight. I'm going to go through everyone's arguments and come to a decision for myself. Who would have thought it would come to this? With great trepidation I write this article. Not because I want to, but because I have to. Then again that's the only reason I write. 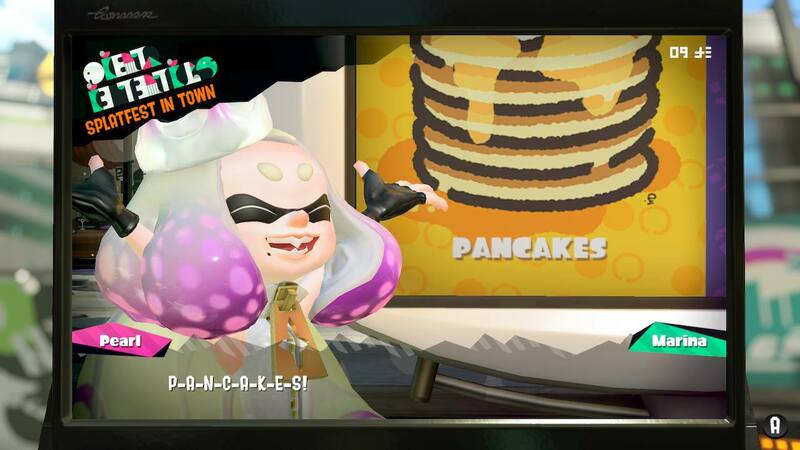 The power of pancakes has compelled me to come to you today. I don't believe I have to explain pancakes to you. The universally acclaimed breakfast dish is a staple of multiple cultures (check out Wikipedia) AND that includes video game culture. By RAWKHAWK2010 - Rawk Does Not Make Articles...Except Sometimes. So there's a "Splatfest" coming up. Something about waffles and pancakes. Something about which one is better. Something Ludwig is unable to make judgment on because of an incurable illness (one a Borginian cocoon won't fix) which has led to other KoopaTV staffers taking this batter matter into their own hands. I don't know about all that...but more so than pancakes, yes. By LUDWIG VON KOOPA - The State of the Union 2019, and the state of pancakes vs. waffles? Contrary to the parenthesis in the title of the article, we've almost always covered the opposition party's rebuttal statement during the State of the Union (delivered by the President of the United States of America). We just wanted to put special emphasis on failed Democratic candidate for Georgia governor, Stacey Abrams, and her rebuttal to President Donald John Trump. In fact, here's a link that will warp you right to where she starts, because she has a different opinion to yesterday's article about waffles. Stacey Abrams is notable for being compared to Aunt Jemima, the pancake-making legend, in an election robocall. Thus, she's in the best position to offer thoughts on this. Featured in this reaction log are myself, Rawk, Kamek, and Witch Princess. By LUDWIG VON KOOPA - Look! I got the 2019 in there correctly! What an incredibly quick month January 2019 was! And the question on all of your minds is... did KoopaTV get off to at least a decent start for 2019? Let's find out and get right into it. Phoenix Wright Impersonator Arrested For Poisoning—Exclusive Fight Footage Inside! — Phoenix Wright and Furio Tigre have an intense fight, with a court battle and the very question of identity on the line. KoopaTV has exclusive footage of that fight, so we're the best source of information on that. Splatoon 2 Family vs. Friends Splatfest: White Ink Was A Bad Idea — Splatoon players have been clamouring for over three and a half years now. 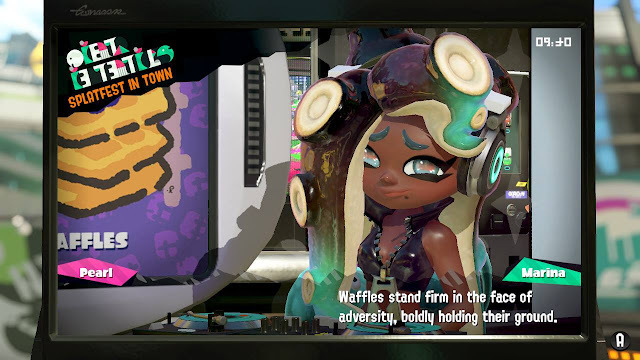 They got it in the Family vs. Friends Splatfest... and it was an atrocious undertaking. Ludwig explains why. What Is A Good Game Purchase? — Wendy O. Koopa cares a lot about her coins, so she wrote up some tips from her experience about the criteria that make up a good videogame purchase. Irrationality: Gillette and So-Called “Toxic Masculinity” — There was a very controversial advertisement that shaving & grooming company Gillette released, and KoopaTV felt the need to provide a unique take on it. Packed with gaming references to justify the article's existence on a gaming site. Booyah! Is Significant. Booyah! Back In Splatoon 2 — Yet another piece of superb Splatoon 2 content this month, this time about the very important “Booyah!” phrase that's so prevalent in Inkopolis culture.